City tour in old part of the city: the architectural complex "Khazrati-Imam", Chorsu gigantesque oriental bazaar on the right of the square Chorsu. 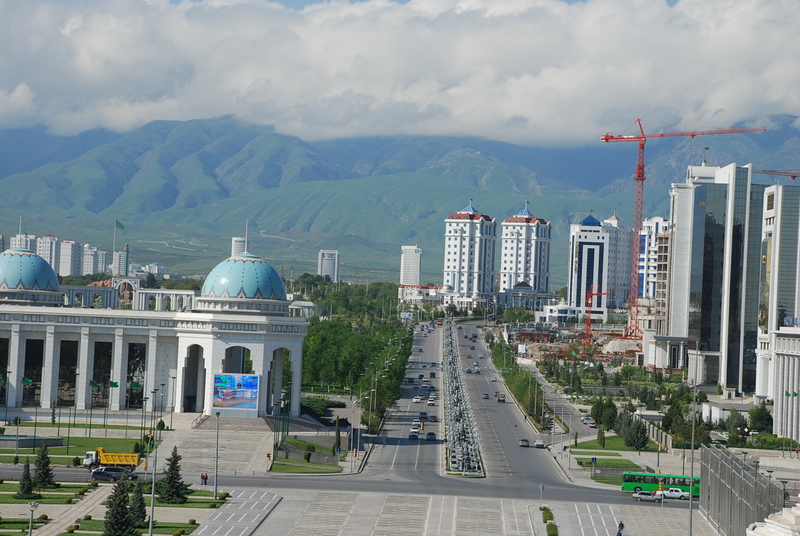 City tour in modern part of the city: Museum of Art, Amir Temur Square, Broadway, Tashkent Metro, Independence Square. Lunch during visits. Dinner. O/n at hotel. Breakfast at hotel. Following tour of Samarkand: Registan square: Medreseh Ulughbek (15th c.), Medreseh Shir-Dor (17th c.), Medreseh Tilla-Kori (17th c.).Bibi-Khonum Mosque, market place. Lunch. PM, visit to Mausoleum Guri Emir - Tamerlane's Tomb (14—15th c.). Dinner at restaurant. O/n at hotel. Full day of walking in the village and mountains, meeting with local people. Diner. Overnight in homestay. Breakfast in the hotel. Visit the Jewish Quarter with Sinagogue. SS of Bukhara: Poikalon (XII—XVI c) architectural ensemble of “Masjidi Kalon”, “Miri Arab” madrasah and minaret Kalon (46 m). Ulugbek Madrassah 1417 was the earliest of three commissioned by the enlightened Timurid ruler. Abdul Aziz Khan Madrassah (1652). 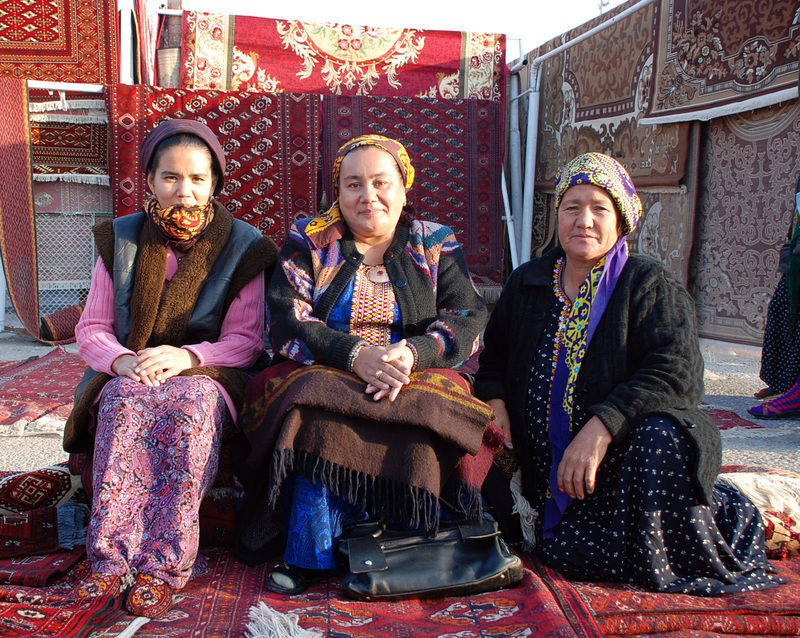 Trading Domes including Togi Zargaron, Togi Telpak furushon and Togi Saraffon Afghan trades. Tim Abdullakhan and one of the most elegant trade halls. Magoki Attori mosque, Labi-Hauz (XVI—XVII c) — a complex with Nodir — Devon Begi madrasa. Lunch. ARK Fortress (VI — XIX c) — in middle ages it was a whole town with the emirs house, with wives, mosques mint place, government institutes, store rooms, a prison and a square for public executions, Bolo Khous Ensemble, Samanid mausoleum (IXc) 1st brick building shaped as cube covered by dome with unrepeatable geometrical brickwork design, Chashma Ayub Mausoleum. Dinner. O/n at hotel. Breakfast in the hotel. 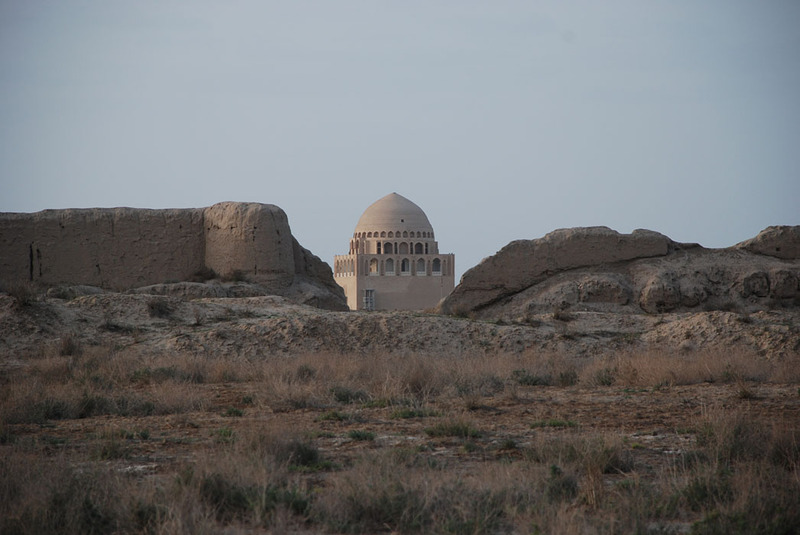 A trip out of the city for a visit to summer residence Sitorai-Mokhi-Hossa (19th c.), Naqshband mausoleum. Lunch. PM, free time: possibility to go to bazaar, hammam, massage of legs*. The puppet show is possible an optional visit, additional charge is 8$ per person. Walking to have a view over the town at sunset. O/n at hotel. Breakfast in the hotel. Starting at 08:00 drive to Bukhara (450 km, 7 hrs)through the desert along the course of the Amudarya River. You’ll make a short photo stop at the sight of Amudarya (Oxus River).Lunch on road at Chaikhana (Tea House).We arrive late this afternoon in Khiva – the only "Museum-city under the open sky" in Central Asia that has been completely preserved up to the present day (35 km, 30 min) and accommodation. Dinner. O/n at hotel. Breakfast in the hotel. 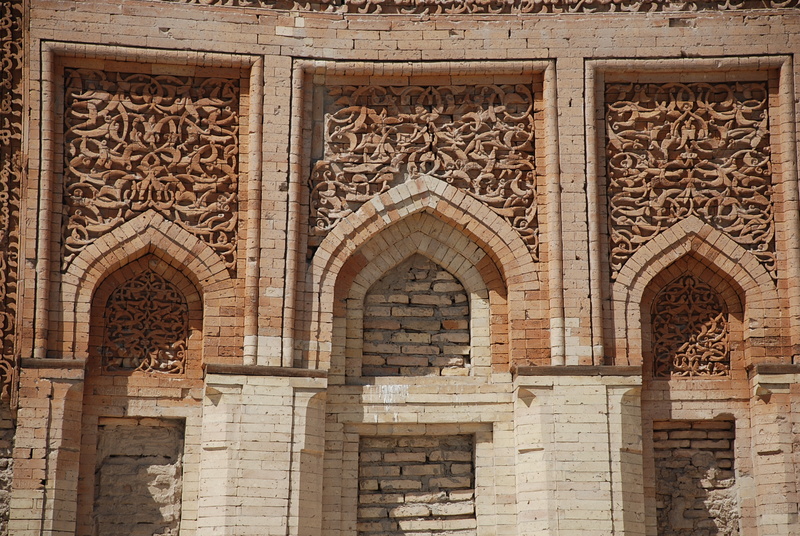 City tour around the architectural complex Ichan-Qala - the historical center of Khiva, which has been inscribed into the UNESCO World Heritage List: Kunya-Ark khan's castle - the inner citadel of Ichan-Qala (16-17th cc. ), Kalta Minor Tower (Short minaret) that would have become the biggest and tallest minaret in Central Asia (19th c.), Muhammad Amin-Khan - the biggest medieval medressa in Khiva (1845-1855 yy. ), Djuma Mosque with 213 wooden columns and a minaret 32,5 m height (10th c.). Lunch at local restaurant. Following tour of Khiva: Tash-Hauli (Stone courtyard) palace looking like a fortress with a high battlements, towers and fortified gates (19th c.), Ak-Mosque (White Mosque) - a small quarter mosque by the gates of Palvan-Darvaza (1838-1842), necropolis of Pahlavan Mahmud - the cultic center of Ichan-Qala (1810-1913 yy. ), residence of Islam Khodja (1910 y.) - the Vizier (Minister) of the last khan. 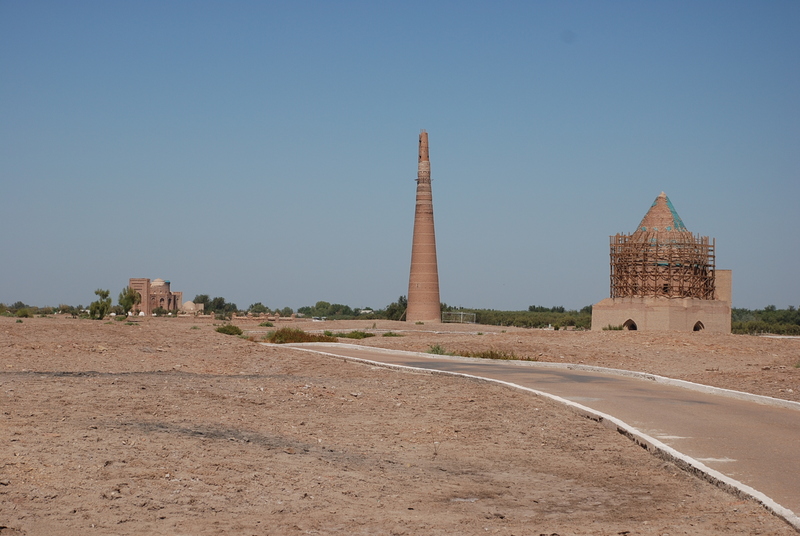 Ensemble consists of the smallest medressa in Khiva and a minaret whose top platform has a height of 45 m and is the highest observation point in town. Walking to have a view over the town at sunset. Dinner. O/n at hotel. Drive to Darvaza. Arrive. Leave the road at Darvaza and follow desert trails arrive at fiery gas crater. *Hotels are subject to change according to their availability at the moment of reservation. In case of changing, similar hotel will be proposed. · Porter charges at airports and hotels. *Due to changes in hotels and local conditions in the country which are out of our control, the above details are subject to change. Every effort will be made to provide services or substitute services should any unforeseen changes have to be made. EXCLUDED services in Turkmenistan: visa consular fee (price depends on place to obtain), Turkmen tax at border (14 USD p/person), Turkmen entrance tickets at sites, photo/video fees, meals L D, guides, excess luggage, gratuities, personal items, porterage, international flights, other services not included above.